Relocating a house is an extensive process. First comes the house lifting, then the actual moving, and finally the setting down on a new foundation on a new property. The bad news is each step involves a plethora of factors to consider as well as special equipment to carry out the process. The good news is with the right professional to help you, relocating a house can actually be relatively easy as well as cheaper and more environmentally conscientious than building a new house. Do you love your current house and just need a new location, or have you found the perfect house but the seller requires its removal off the property? If your emotions are involved and you can’t bear to say goodbye to a house, this option is for you. Do you have a great plot of land but don’t want to waste resources on building an entirely new house? For the environmentally conscientious, this is the ultimate recycling. Do you have the house and land but need to bring the two together in the cheapest possible way? If you’re on a budget, hiring professionals in house lifting and moving can be the cheapest option. Professionals make this complicated process easier. They’ll make sure it’s a possible option for you, taking into consideration factors such as necessary permits, size, weight, distance between house and plot, and all other possible hindrances on the road. They will have the advanced equipment and experience to move your home with the utmost care. And afterwards, you’ll have that home you love, you’ll have achieved the ultimate recycling project, and you’ll have saved money. Relocating a house is not always an option, but if it’s an option for you, take it into consideration. 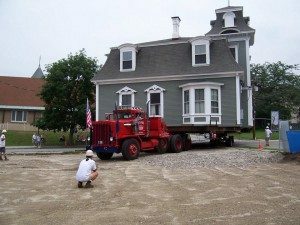 It may seem like an enormous undertaking, but with the right professionals and tools to perform the house lifting and moving, it could be the perfect opportunity for you.